What&apos;s New in Eau Claire, Wisconsin? Eau Claire has been compared to Portland, Austin and Brooklyn in the nicest of ways. This Midwest city, however, has written its own “indie” story of creativity and ingenuity while staying true to its roots as a picturesque destination at the confluence of two rivers. Need proof? Take a look at all that’s new for 2019. The massive Uniroyal factory in the Galloway District of Eau Claire closed some 25 years ago, then went through a successful transformation into an artists’ and entrepreneurs’ enclave and renamed Banbury Place. 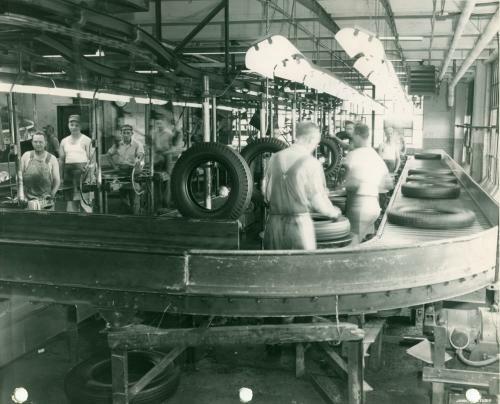 In April, the first floor of Building 13 will become home to the Uniroyal Goodrich Tire Factory Gallery, a permanent exhibition of photos, artifacts and historical tours. Before the exhibition opened, artists and art lovers celebrated the 10th Annual Banbury Art Crawl, Feb. 8-9. This creative cure to cabin fever offered visitors a chance to roll through more than 100 artists’ permanent and pop-up studios to both browse and buy. 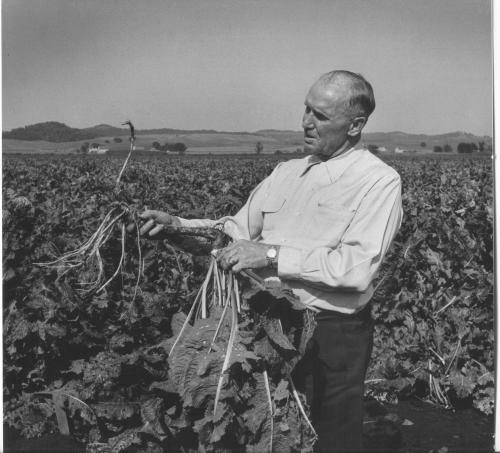 This year Silver Spring Foods celebrates 90 years since founder Ellis Huntsinger first planted a half acre of horseradish that resulted in what is now an award-winning horseradish and mustard maker empire. And the company is using the anniversary to show us that it’s up for a challenge – to produce 100 million pounds of finished products (not including the weight of bottles), up from its previously set record of 95 million pounds. In 2017, the women-owned Dotters Books independent bookstore existed almost exclusively online, with a few pop-up shops throughout the year. However, it didn’t take long for book-lovers in Eau Claire to embrace the new business, and that led the owners to open a bricks-and-mortar location in Eau Claire’s East Side Hill neighborhood. Sharing the works of a diverse group of authors, Dotters Books hosts monthly book clubs and a weekly children’s story time event. Embracing weirdness is what independent store Odd Humyns is all about. It functions as a retail space selling pins, patches, zines and art supplies in addition to hosting intimate concerts in its underground venue, The Salon. The wellness hub known as The Center just marked five years of providing good-for-you services. Some 40 practitioners here offer yoga, meditation and other wellness services and activities. For 2019 they’re planning to create meditation trails on the acres of land surrounding their building. This quaint and bright café, which features an extensive menu of homemade food, sweet treats and coffee drinks, celebrates its five-year anniversary in 2019. 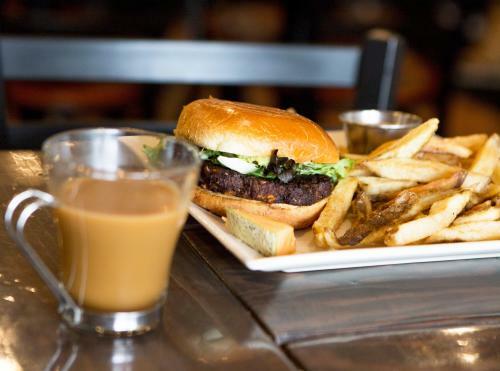 Pop in and you’re bound to see plenty of locals enjoying the food and living the Eau Claire culture. Since opening its doors in February 2009, this quirky downtown store grew to house the creations of over 150 local artists and artisans, expanded to provide screen printing services to local businesses and founded the Artist Market of Eau Claire, which takes place on summer Saturdays. They tried it in 2018 and it proved so successful they’re planning an encore. 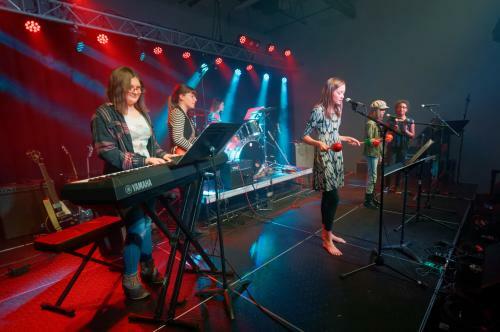 Last year Eau Claire Music School teamed up with organizers of local concert series, Sawdust City Limits, to create the Girl’s Rock Band Experience, a two-day workshop for young girls, trans and gender-non-conforming kids to learn from local musicians about performance and community. The workshop culminated in the attendees opening for a local rock show. This workshop and music event returns this year with lots of rockin’ on the agenda. Bluegrass-lovers from all over the country have been gathering in Eau Claire each June for the past four years for the Blue Ox Music Festival, a long weekend of foot-stomping good times. This year, Blue Ox hits the five-year mark with the 2019 festival set for June 13-15. The line-up includes musicians who haven’t missed a year, including Pert Near Sandstone, Sam Bush and Greensky Bluegrass. Playing the festival for the first time this year, the Duluth band Trampled by Turtles is sure to be a hit. 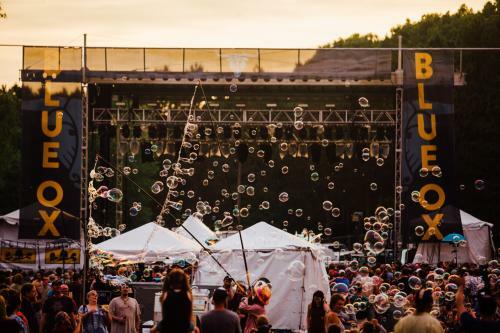 Just three miles from the heart of downtown and situated along the Eau Claire River sits River Prairie Park, a gathering spot that’s made its mark as a hot spot for outdoor music. Last year they debuted a Wednesday night Rock’n on the River concert series. This summer, they will add a Monday night country concert series. Before and after the concert, enjoy food and libations at the new restaurant there, 44 North, an American gastropub and arcade. The owners of Infinity Beverages Winery and Distillery never seem to sit still. They plan to follow up last year’s successful release of their own line of homemade, ready-to-drink cocktails and canned wine with a maple syrup rum produced in-house. The Brewing Projekt microbrewery has just moved into bigger digs in a building that was a meat-packing factory for the first half of the twentieth century. This new location along the Chippewa River State Trail in the city’s Cannery District features riverfront views and easy bike trail access, not to mention a nice line-up of food trucks in the warmer months. On Saturday, May 18, they will celebrate four years in business and the grand opening of their new taproom with food, live music and exclusive beer offerings. 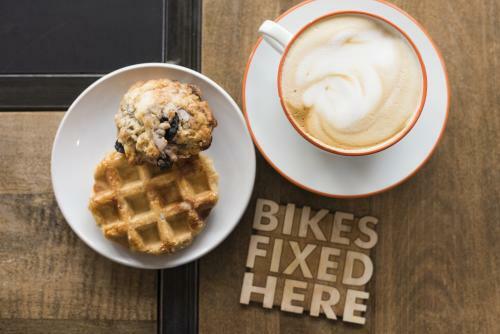 SHIFT is the only place in Eau Claire where you can enjoy craft coffee drinks and baked goods while simultaneously getting your bike repaired. This funky do-it-all spot has one year under its belt and, to prove it’s not done shifting gears just yet, it’s added beer to its menu, is now hosting live music events and has rotating art displays. Determined to help visitors and locals discover their perfect Eau Claire adventure, the local tourism marketing organization Visit Eau Claire set out to create a visitor center of the future. The first tip-off it’s not your run-of-the-mill center is the name – it’s the Visit Eau Claire Experience Center – and inside you’re just as likely to stumble on a local band performing to a pop-up shop to an artist demonstration to a food sampling. The center is located at the corner of Gibson Street and Graham Ave. on the first floor of the new Pablo Center at the Confluence. This microcosm of what makes Eau Claire “Eau Claire” should be every visitor’s first stop. Check Visit Eau Claire’s Facebook page to find out what the staff has planned when you’re in town for a visit.